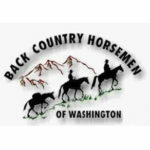 Last month we introduced some wonderful riding in Washington State and this month we continue that theme with what to expect from five more BCHW chapters. There’s something for everyone to enjoy! The Methow Valley with BCHW is sponsoring a state-wide work party June 29- July 4. We will be based out of the Twisp River horse camp and will work on numerous trails in the area. It is a great opportunity to help out and learn about this area. Visit mvbch.blogspot.com for more information. Nisqually Chapter is located in SE Thurston County. Meetings are held at the Yelm Moose Lodge at 7 pm on the first Tuesday of each month. Members spend time riding on Joint-Base Lewis McChord, for which a permit is required. Permits are issued from JBLM Range COntrol, located on-base. We also ride Nisqually Mashel State Park. A Discover Pass is required to park there. Pack Forest and several rail trails, such as the Yelm-Tenino Trail, are also nearby. Traildusters Chapter is located in Snohomish County with members from Duvall to the Mt. Vernon area. Our area encompasses a diverse area of riding. We ride at several tree farms in the Arlington and Sultan areas. Lord Hill Park between Snohomish and Monroe is a good place for a 2-3 hour ride. Trails originating in the Darrington and Skykomish area lead to the Pacific Crest Trail and give us excellent back country experiences. From the Columbia River to the center of the Cascades, Kittitas County has it all. North County has the Naneum State Forest, broken sage brush to high land meadows. Northwest Kittitas County has the Teanaway Valley now called the Teanaway Community Forest. This area has a lot to offer equine users, from single-track trails to abandoned logging roads. Then to the west you can ride the Alpine Lakes Wilderness filled with highland lakes and high rock peaks. Alpine Lakes Wilderness also has a lot to offer equine users including overnight pack trips and day rides. To the south you can find miles of trails in the Taneum Creek drainage. You will be sharing the trails with ORV users. Further southeast are miles of cross country riding in areas like Joe Watt Canyon, home of the Back Country Horsemen May 14TH Prize Ride. Mt. Adams Chapter BCHW is blessed with an abundance of great riding trails. Mt. Adams Horse Camp is the hub of a network of trails, some of which access the Pacific Crest Trail and the Round-the-Mountain Trail in the Mt. Adams Wilderness. Nearby is the Indian Heaven Wilderness with several entry points and the PCT traveling from south to north through the center of it. All of this system of trails is located in the southeast side of the Gifford Pinchot National Forest. Mt. Adams Chapter has also helped develop equestrian trails on two Washington State Parks—the Dalles Mountain Ranch (part of the Columbia Hill State Park complex) and Brooks Memorial State Park located north of Goldendale on State Hwy 97. For information contact Mt. Adams Chapter’s Director Teunis Wyers, 590-493-2221.